Myth: My two options for data recovery are using software data recovery tools or paying thousands of dollars for “professional” data recovery. The software data recovery myth boils down to the belief that there are only two kinds of data recovery techniques: software-based data recovery and expensive “Level-3” data recovery. If this were true, $300 Data Recovery would be out of business. Instead, we are thriving and pioneering a new kind of data recovery: hardware-software based data recovery (with “clean room” recovery mixed in). But before we get into that, let us examine the two conventional methods. Software-based data recovery requires the hard drive to mount in the operating system. On a PC, that means it shows up in the BIOS or Window’s Disk Management. On a Mac, this means the hard drive appears in Disk Utility or on the Desktop. If the hard drive doesn’t show up on the computer, then software data recovery tools can’t access the hard drive and therefore can’t help recover any data. Even if your drive is visible to your OS, running software data recovery tools can kill your hard drive. Repeatedly encountering bad sectors and re-reading problem areas on the drive can result in increase damage to the platters and a greater number of unrecoverable sectors. Another significant risk when running software on your PC or Mac is that your OS may also attempt to “repair” your hard drive while it’s connected to the computer. This “repair” can completely destroy data when the hard drive has bad sectors (and most hard drive’s we receive have bad sectors along with more serious problems). This automatic repair often happens in the background without any user approval or knowledge. Read this article on Deepspar’s blog for more details about the software data recovery myth, including the risks of connecting a bad drive to your computer (or even just leaving it powered on). If you need your data back, don’t run the risk of destroying it forever by running software data recovery tools! Clean room data recovery companies, in theory, can recover just about any bad hard drive (although there are hard drives which are unrecoverable by any means — or misdiagnosed as unrecoverable). Most people believe that if software tools can’t recover the data or if their computer can’t “see” the hard drive, then the hard drive is physically broken and needs “Level-3” data recovery. Belief in this myth costs people thousands of dollars every day (and keeps expensive data recovery companies in business). We have an ISO Class 5 clean room. We use it for problems which require us to open the hard drive’s cover (like stuck heads or bad heads). But, most hard drives don’t need a clean room for a safe and successful recovery. Our secret to affordable data recovery is our mastery of “hardware-software based data recovery” techniques, which avoid the need for high data recovery prices and save our customers lots of money. Working with a hard drive on a firmware level, we can do things like: disable corrupt hard drive features (e.g. ; SMART), disable bad or weak heads, use different methods to read (and re-read) the bad sectors off the hard drive, and avoid bad sectors on the hard drive (to name a few). These types of features are impossible to access using software tools alone or by hooking up a hard drive directly to a PC or Mac. Read more about the tools used by $300 Data Recovery and other top data recovery companies on our Tools page. A crucial aspect of our hardware-software based data recovery is addressing firmware problems on the hard drive. The firmware on the hard drive is comparable to the operating system on your computer. If the operating system crashes (e.g., Window’s “Blue Screen” or Mac’s Kernel Panic) on your computer, the computer won’t function properly. Similarly, if the hard drive’s firmware becomes corrupt, the hard drive won’t work properly (it may become inaccessible, “click,” or it may not spin up at all). Software Data Recovery Myth – Hard drive’s PCB and PCB repair tools. By using specialized data recovery hardware and software tools designed to help identify and fix firmware problems, just about all firmware issues can be fixed without the need for expensive level-3 data recovery repairs. Software-based data recovery tools can’t deal with these problems because they can’t “talk” to the hard drive on a vendor-specific base-level. Finally, our hardware-software based data recovery techniques deal with the hardware on the hard drive itself: the PCB. The PCB is the circuit board on the bottom of the hard drive. This circuit board, just like your computer’s motherboard, is filled with small components (like resistors, RAM chips, ROM chips, fuses, and jumpers). If any of these small components fail, the entire hard drive may stop working. Diagnosing and fixing these little PCBs safely is something you only learn from experience and practice. 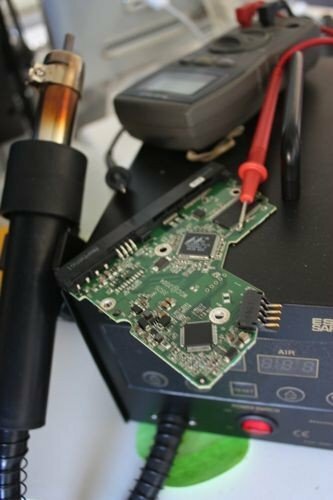 At $300 Data Recovery we have the tools and knowledge necessary to replace and fix all damaged PCBs. We also go beyond hardware-software based data recovery and use our ISO Class 5 portable clean room for problems like weak motors, bad heads, heads stuck to platters, and other rare issues. We can not recover from some rare hard drive failures, includes failures requiring “platter swaps,” as these problems are currently too expensive to perform at our low rate. Read more about Our Process to see the steps we take when diagnosing and recovering your hard drive. To learn more about the software data recovery myth, read this in-depth article regarding software/hardware tools by Deepspar on Technibble.